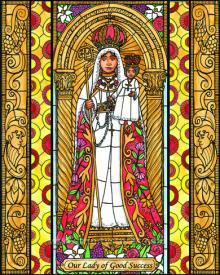 Feb 2 - “Our Lady of Good Success” © art by Brenda Nippert. Happy Feast Day! During the late fifteenth and early late sixteenth centuries, Mary appeared to a holy Spanish Conceptionist nun who was abbess of a convent in Quito, Ecuador, Mother Marianna de Jesus Torres. Mary made many predictions for the nineteenth and twentieth centuries which did come true. She appeared to Mother Marianna over a period of ten years. Our Lady asked Mother Marianna to have a statue made in her likeness. She wanted it to be life sized and even had Mother Marianna measure her height with the rope from her habit. She wanted people to be able to come to her and feel that she was right there with them, and like one of them. When the statue was completed, she requested it be placed above the seat of the abbess as a sign to everyone that she watched over the convent and they were in her capable hands.